Early, planned and productive mornings are a favorite life hack of the super successful, but you can’t tell me that everyone’s on the “millionaire morning” bandwagon. Since Benjamin Franklin penned “Early to bed and early to rise, makes a man healthy, wealthy and wise”—read by Americans nearly 300 years ago in Poor Richard’s Almanack—trying to find a way to get up and out the door faster has been a staple of living a successful life. We’ve seen the science that tells us morning people are better problem solvers, have better moods and are more productive. And it’s clear that establishing a morning routine might be the easiest way to create time in your day, allowing time for the secrets of the highly successful your day is missing. But real-world examples and changes in the way our world works makes us wonder: Is the “millionaire morning” really about getting up early? Oprah’s manic schedule is a staple of modern success mythology. It starts with the early morning we all strive to replicate, waking up at 5:45 a.m. to express gratitude for the day, make her bed, meditate for 20 minutes, work out for 30 to 60, and then record two TV shows (starting at 7:30 a.m.)—all before breakfast at 11:30. Oprah’s morning routine represents the strict schedule many try to follow. It’s a stereotypical “get more done by maximizing time” mindset we try to seamlessly replicate. But trying to find a universal trend gets complicated when you compare her morning to someone like Mark Zuckerberg. Mark Zuckerberg was admittedly “never a morning person” until his daughter, Max, was born. Now, thanks to her, he gets up around 8 a.m. (when he’s not working all night). One of the most interesting elements of Mark Zuckerberg’s morning is that he starts his day with his cellphone, checking Facebook, looking at the news, discovering what’s going on in the world. It’s a move that goes against the experts who tell you to remove entertainment and distractions from where you sleep for more productive mornings and days. Although Warren Buffett does wake up at 6:45 a.m., he doesn’t make it to the office until the market opens, and he hates having a full calendar so his schedule is never set in stone. Once he is at the office, he often spends 80 percent or more of his workday reading and delegating work through brief phone conversations, focused on making important decisions. His routine is an ideal example of the fabled 80/20 principle—the concept that 80 percent of results come from 20 percent of your efforts, a staple of productivity and efficiency for more than 100 years. Buffett spends 80 percent of his effort on learning, reading and studying, while the other 20 percent (maximum—he even says it’s more like 90/10) is spent on working. Morning routines have achieved mythical status among students of success: Bill Gates’ multitasking morning, Richard Branson’s 5 a.m. wake-up, Peter Diamandis’ 6:30 a.m. wake-up and meditative mantra, Elon Musk’s up-at-7:00 schedule, and Steve Jobs asking himself every morning, If today were the last day of my life, would I be happy with what I’m about to do today? But if you look hard enough, you’ll find that the super successful don’t always start the day with a strict crack-of-dawn schedule. Like Mark Zuckerberg lying in bed to check Facebook, Box CEO Aron Levie checks his email from bed knowing it’s a bad habit. Reddit co-founder Alexis Ohanian tries “to be up by 10 a.m.” and begins his day by feeding his cat. The co-founder and CEO of Genius, Tom Lehman, works from 3 in the morning until 10:30 a.m. On the off-chance he wakes up early, “I make sure to tell everyone about it.” He also uses his phone as an alarm (but puts it on “do not disturb” mode)—and checks news and Twitter the moment he wakes up. Winston Churchill didn’t even get out of bed until 11:00 a.m. on most days. You can find plenty of examples. Is “early to bed and early to rise” no longer relevant in the 21st century? “Early to rise” might have been an excellent mantra for 18th-century America, but overwhelming modern evidence suggests the success of morning routines are personal. What you do in the morning depends on who you are, and though there is a researched correlation between early risers and emotional state, the American Psychological Association suggests that it’s likely due to the standardized 8-to-5 workday—the workday our society has adopted fits morning people better than night owls. For today’s 21st-century entrepreneurs and innovators, work goes well beyond the typical workday. Today, the way you think matters more than how early you get up. Technology is rapidly transforming the way our world works and the rate of change we’re experiencing. Just 20 or 30 years ago, morning routines were the way you “got ahead.” You woke up at 5 a.m. and put in extra time before the workday started. Back before we were all interconnected with email and instant communication, before technological change could happen overnight and transform business, before an entire industry could be disrupted in the blink of an eye—just a few decades ago—“early to rise” worked. But every day, it’s becoming less and less relevant. Today your ability to keep up depends on mindset more than morning routine. To show you why, we’ve invited futurist Peter Diamandis to join us for a FREE online video presentation. 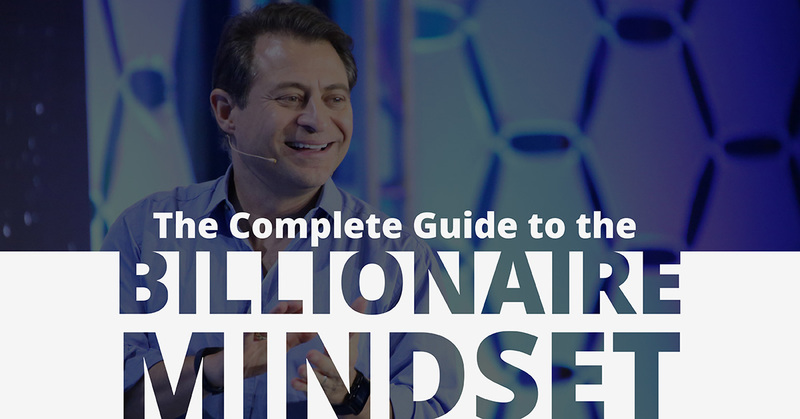 Peter Diamandis shares the Billionaire Mindset Hack you can use to stay ahead in our ever-changing world.